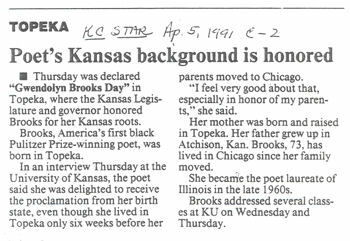 Gwendolyn Elizabeth Brooks was born in Topeka, KS, on June 7, 1917, to Keziah and David Brooks. She lived in Kansas until she was six weeks old, when she moved to Chicago, Illinois, where she grew up . She maintained strong ties with Kansas for the rest of her life. Brooks was raised in a loving home, and her parents were supportive of her education and writing. However, she was not allowed to play with other kids in the neighborhood, and did not have many friends. She spent a lot of her time reading and writing instead of socializing . By the age of sixteen, Brooks had published about 75 poems. She graduated high school in 1935, then attended Wilson Junior College, where she graduated in 1939 with an English degree. 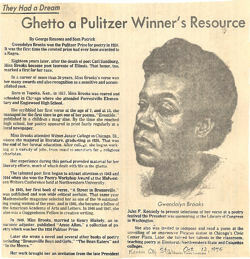 Her first collection of poems, A Street in Bronzeville, was published in 1945. 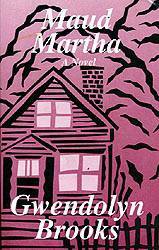 It was praised by readers and critics, and her writing career soared from that point. Over the course of her career she was awarded seventy honorary degrees, a lifetime achievement award from the National Endowment for the Arts, the National Book Foundation Award for Distinguished Contribution to American Letters, and she has been inducted into the National Women’s Hall of Fame . She received the Pulitzer Prize for Poetry in 1950, for her second collection, Annie Allen. She was the first black writer to receive the prize. She was the Poet Laureate of Illinois, and also served as Poetry Consultant to the Library of Congress (the position later called Poet Laureate of the United States) . 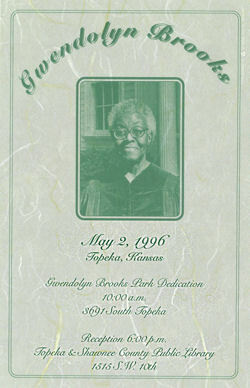 In 1983, Brooks was awarded an honorary degree, D. Litt., from Washburn University of Topeka. 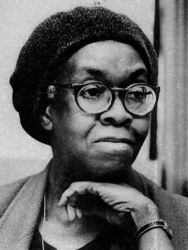 Gwendolyn Brooks died in 2000, at the age of 83 . 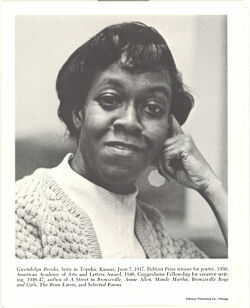 Poetryfoundation.org features a detailed biography and bibliography and links to 22 poems by Gwendolyn Brooks. 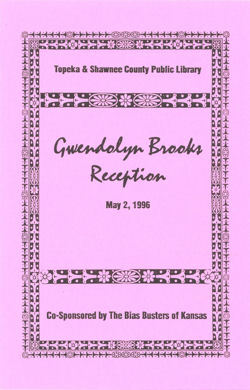 The Circle Association's Gwendolyn Brooks page has links to biography, bibliography, and links to many Brooks poems. Chickenbones: A Journal for Literary and Artistic African-American Themes has a website with a detailed biography and photos of the poet. Famouspoemsandpoets.com's site includes bio, resources, quotes, and links to poems by Brooks.